[Privilege] One person sticks like and it is one soft-drinks ticket present. It is one sheet about a public-bath ticket by a hope. It is an enough ryokan with a hot spring to the environment which the most skillful base of a mountain was quiet, and was blessed also with delicacies from the mountains even if Yugawa flowed through the heart of the mountain of the Okami goddess, and a hot spring resort and it was in the emotive enough bessho.From now on, the talk that the madam of those days ordered what 1000 shares of azaleas for one freight car from distance with the debt has been heard about 100 years ago.The azalea is planted in the base of a mountain, one share piles up the annual rings which also become one mountain, and 2600 shares are making red-and-white peach color and a grand scene.the view of an azalea -- most -- Mr. Yasunari Kawabata was fond and stayed at the "Kiyosumi" to say, and he heard that "the waltz of the flower" was written.Each, such as a wooden 4 stories high structure main building, a thatched Separate from main "Sobaku-an Sobaku-an", and "a Taizan-tei (drawing room 2)" it is [ high-class feeling ] most facilitated of a Taizan-tei, has effect.If the photograph of the bathtub before a renewal is seen, he will be surprised at the bathtub of the tile which has not been seen, but the tile is inserted in a present indoor hot spring and family bath, and the family bath of the circular bathtub has become an attractive point enough thing. "Wooden [ 4 stories of ], a main building"
There are three charter baths. "Seasonal kaiseki cuisine obtained in the restaurant of a single room"
A Shinano-yuki-masu traut, the Shinshu salmon, a Ueda local chicken, contract rice, a mushroom, Shinshu horse flesh from a saltpan, etc. It assorts simmered dishes, dressed dishes and stir-fried dishes, telling, etc., and they are a broiled fish of a rolled omelette, bacon, and lettuce, sweetfish candied food, a wheat and rice with Chinese yam, and miso soup. Man and woman are open-air bath juxtaposition. It is a drink-spring possible and un-heating at fountainhead free-flowing hot-spring water and a fall crest. It is hot-spring payment cleaning every day because of un-circulating. 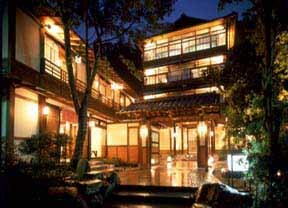 * Winter and an open-air bath may be heated.Overflow of an indoor hot spring is to an open-air bath. It is stone bath and a fall crest and is a drink-spring possible. Family bath As for an attractive point of a bathtub with 1 and 2 [ circular ] and a Taisho romance, and 3, a washing place is a straw mat. Up to the Bessho-Onsen station Reservation required. Those with a public shuttle bus.